One of the fabulous board members of "We Will Survive Cancer." Copa: Where are you from Michael? Michael: I consider myself a native of Northern Virginia and the DMV (Washington, DC metro region).. I grew up in Fairfax, VA and have lived in Great Falls for the last 10 ½ years. Apart from my college years, I lived between the USVI, Maine, and DC for a few years in elementary school. I have also traveled extensively and worked within many cultures – I carry a lot of those rich experiences in my self-identity too. Michael: Virginia Tech for Life! – Go Hokies!!! I will keep VT simply put - we could make a whole book on my Virginia Tech experiences.. I also graduated from Robinson Secondary School in Fairfax, VA and from Culver Military Academy’s 3-Year Summer Naval program. I went to Robinson for grades 7-12 – we had nearly 5,000 kids in the school. CMA is located on Lake Maxinkuckee in Culver, Indiana. CMA’s ‘flagship’ is the largest square-rigged sailing vessel on fresh water in the world. Michael: What do you do?’ always seems to be the first question asked in DC when meeting new people – quite a few people even skip the basic name intros.. I typically answer along the lines of “I live with passion and make everything fun!” or on occasion <when someone skips the names> I pull a ‘Kramer’ with “I do very well – thank you!” The bottom line is that I take a lot of pride in my life, relationships, and work on all levels – but refuse to let a job define who I am. As for the professional answer,, I am a Project Executive for an Owner’s Representative firm – we represent building owners, developers, and commercial tenants on large planning, design, and construction projects. My role is a mix of BD, growing client relationships, advisory consulting, and managing project teams. 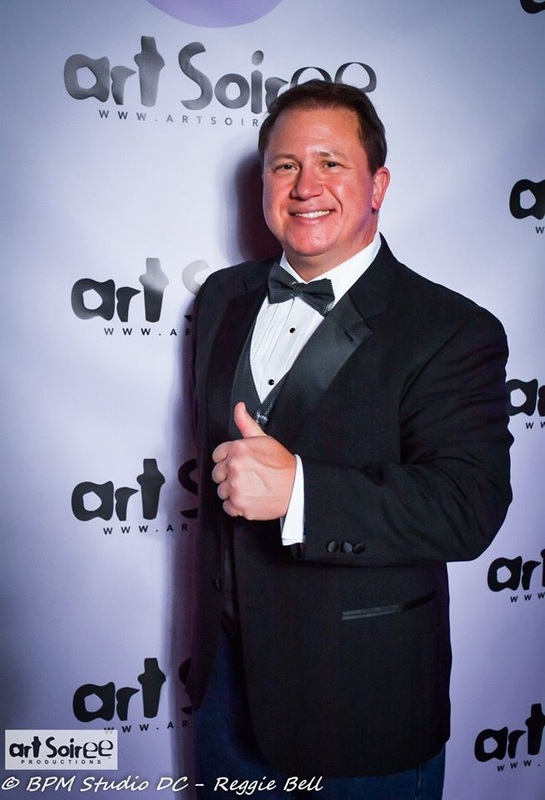 Through-out my career, I have had the fortune to deliver successful projects in (32) US States and on four continents. Michael: I have been a been a board member of WWSC since July 2012. Although I have always been a philanthropist and support a number of excellent causes, I give a great amount of time (my most valuable resource) to WWSC. The reason I am involved with WWSC is because I directly see the positive impact we make in families struggling with cancer. I have met a number of patients and their family members through our programs – and I know we have made a big difference. Just like a smile is contagious, so is compassion. Copa: How would you describe yourself when it comes to commitment and service? Michael: I focus every day in putting out strong positive energy in everything I do. The same goes for looking at issues and challenges – as opportunities. I share in Anthony Robbins’ view - “The Secret to Living is Giving”. In the big picture, my life is wealthier for having a winning attitude and karma returns what you give. Copa: Tell us about the "Pink Pumpkin" event and what it benefits? Michael: WWSC has SM-trademarked ‘The Great Pink Pumpkin’. 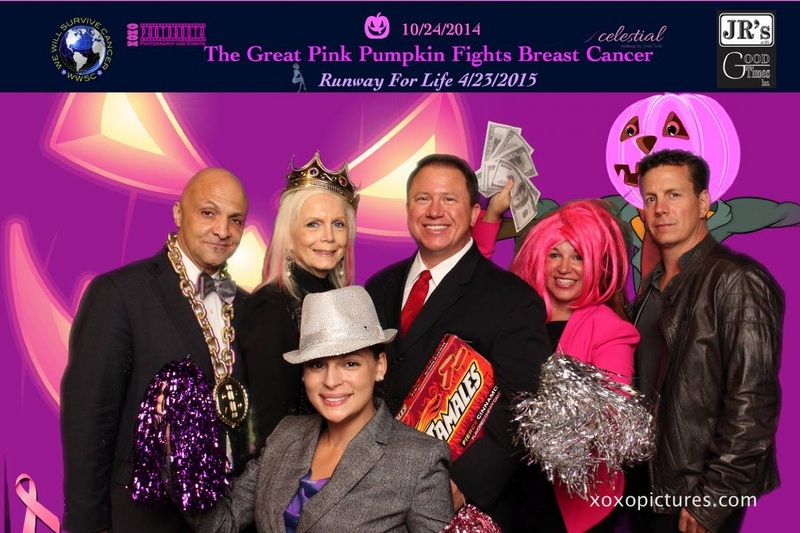 The annual event is ‘The Great Pink Pumpkin Fights Breast Cancer’. There are four goals with the event: 1. Promote National Breast Cancer Awareness Month, 2. Promote WWSC’s growth with its audience and supporters, 3. Act as a fundraising catalyst kick-off for our major Thanksgiving & Christmas programs (which largely benefit families with a single Mom struggling with breast cancer), and 4. Engage all attendees in a hugely fun event! Copa: Please tell us more about the entertainment for the evening. Michael: There is so much fun to be had it’s scary! In addition to being an awesome Halloween party, the event includes a fashion runway show, Halloween inspired cuisine, media coverage, a photo booth, a make-up vendor, beauty pageant contestants, a salon providing Pink Promise hair extensions, and great raffle items & prizes. It’s a fashionista extravaganza for the ladies – that supports ladies! The fashion show features the Keula Binelly Collection. Keula is a great friend and Brazilian dynamo who is also providing the catering with her other company - Superb Cuisines. The fashion show is being sponsored by both the top make-up artist and hairstylist in the DMV (Josie’s Faces & Stylist Simon Bechara). WWSC’s media coverage includes organization sponsorships by The Umbrella Syndicate & Copa Style Magazine. We are also thankful for strong promotion from Bisnow, DC’s 107.3 FM, plus multiple photography professionals from the DMV – that constantly donate their time and energy. Another great friend and WWSC sponsor is Linda Suter who is providing the XoXo Photo Booth and launching Celestial Make-Up at the event. XoXo Photobooth provides incredible fun for everyone. Zoe Salon & Spa will also have representatives at the event providing Pink Promise hair extensions – with a donation going to WWSC. Zoe Salon has been a great supporter of WWSC and provides the Pink Promise extensions in their salons for the entire Breast Cancer Awareness month of October. Get your Halloween On early + help support WWSC for a great cause.. 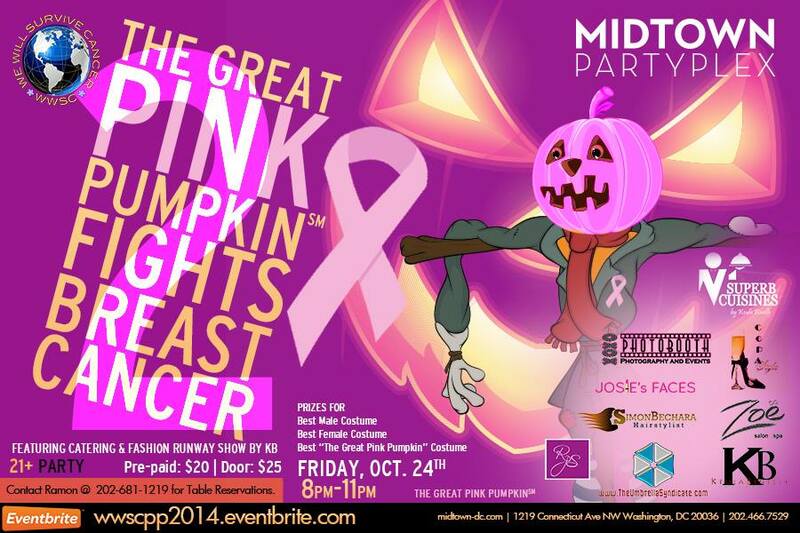 The Great Pink Pumpkin Fights Breast Cancer returns to Midtown this Friday, October 24th @ 8pm..